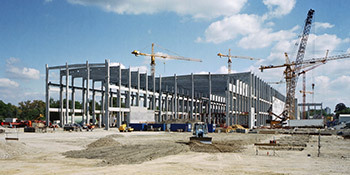 Commercial new builds take place all across the country in various forms, from hospitals and schools to work offices. No matter the construction there’ll be a considerable cost attached and it’s important to stay within budget and ensure the best possible prices. Whether you need someone to take control of the whole project or just a smaller section, you’ve come to the right place and with our service you can compare quotes and keep your costs down. If you’ve made the decision that it’s time to relocate to gain extra space, it’s always important to ensure planning permission regulations are adhered to. This must be done before work commences and you’ll often need to send plans to your local authority. The laws surrounding permitted developments, which don’t require prior permission, vary from installation to installation. The area of renovation or extension, such as the basement, loft or garage. With the costs associated to new builds it would be worthwhile to apply for a number of quotes to ensure the best prices. For up to four FREE quotes, simply complete our quick form and hear from vetted and reputable companies in your area. Project: Hello, I was hoping to gain a rough idea of the build cost for attaching a three bed house to the house on the left. Project: 120 m2 detached house with three bedrooms and 2 bathroom, open plan kitchen. Project: It’s a land with garages to be demolished and to build 5 flats over 2 floors. Project: Plot of land end of terraced houses.cost to build new terraced house on end corner plot simple terraced 2-3 or 4 bedrooms depending on price. Project: An idea of how much to build a 2/3 bed house?